No more piles of paper, cumbersome filing cabinets or crumpled post-its. Whether you utilise Job Tracker Professional as it is or need modifications, you'll enjoy smoother more efficient admin process that will impress your customers and leave the competition behind. Investing in bespoke modifications for our advance Job Tracker Professional Software can save you thousands in development costs compared to creating a system from scratch. It will also enable you to get up and running and realise the benefits sooner. Before you start thinking of having a new CRM or customer database designed, have a look at our off the shelf Job Tracker Professional application. We've spent years listening to customers and designing Job Tracker Professional to meet their requirements. It covers just about every aspect of running a business :- Sales Leads, Quotations, Job Tracking, Invoicing, Purchasing, Document Management, Scheduler, White Boards, Reports, Profit & Loss, and these are just a few of its advanced features. We are also extremely proud that as we 100% own the software and we developed it from scratch, that means we can modify it to your exact needs should you require something a little more tailor made. We've had so many customers come to us thinking they need to develop a system from scratch but they have been delighted to then find that a bespoke version of Job Tracker Professional has given them exactly what they were looking for, sometimes saving 10s of thousands in development costs and far exceeding expectations in terms of delivery timescales. We've also had a lot who took Job Tracker Professional as it is and ran with that instead, finding that it already caters for their needs. If you would like to discuss a bespoke software application, or would like to learn more about Job Tracker Professional and our bespoke development service please call and we'd be happy to chat. Produce Quotations, Job Sheets, Invoices, Purchase Orders and other documents, all designed exactly the way you want. Simple to use	Document Storage against each job, quote, client or customer. Interactive screens displaying Sales Leads, Live Quotes and Live Jobs, helping you keep track of progress. Choice of ways to view your workload and schedule engineers or contractors - Whiteboard, Scheduler or Diary or use all three if you choose. Customisable screens to allow you to capture the information that's important to you. No more re-entering information. Once it's stored against a job/ quote or customer, it can be automatically included in any Documents, Appointments, Emails and SMS created from within the software. Easily Keep track of costs and income on a per job basis , after all, a profit is what every business needs. A lengthy selection of reports available with extensive filter options, enabling you to know exactly how your business is performing. Invoice directly from the software or integrate with Xero or Sage 50, the choice is yours. Either way, there's no need for rekeying data. Job Tracker Mobile enables field staff to access their job information electronically and add photos, notes and even the customer signature. They can also record start and end times to help you keep track of costs. 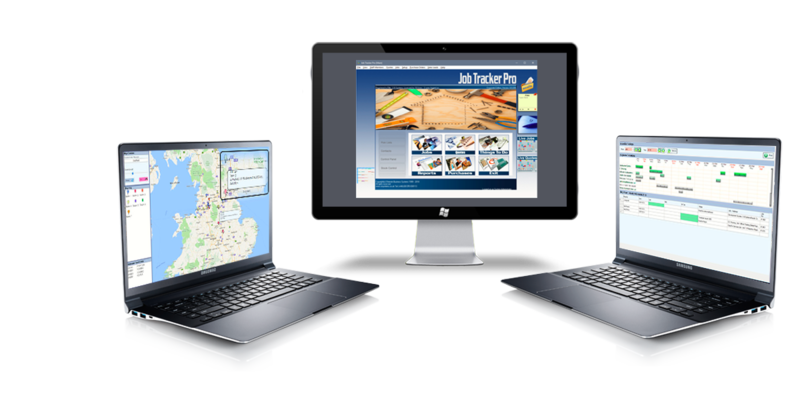 Job Tracker Professional is packed with so many advanced features and the majority of our customers find it meets all their requirements, however, we know that every business is different so if something more bespoke is what you are looking for then we'd be delighted to talk.